Abundant wildlife, beautiful scenery, welcoming villagers and Ethiopia’s highest mountain - all in one trek. Summit Ras Dashen with excellent acclimatisation built into the trek. Visit the rock-hewn churches of Lalibela and ‘Africa’s Camelot’ at Gondar. Enjoy the best service, guiding and accommodation throughout. We had a very pleasant, friendly and knowledgeable local leader. He listened to people's comments and was very attentive. Good knowledge about flora, fauna and history - an excellent leader. We enjoyed the combination of culture and mountain trekking - other companies did not offer this. Good group, well protected. A patient, friendly local leader, very reliable. We were very pleased to find that MK has a fine reputation there, everyone spoke highly of MK. The country has massive potential for tourism. Some very good close contact with Ethiopian people and culture, e.g. the Tej-house in Lalibela; coffee ceremony in village. 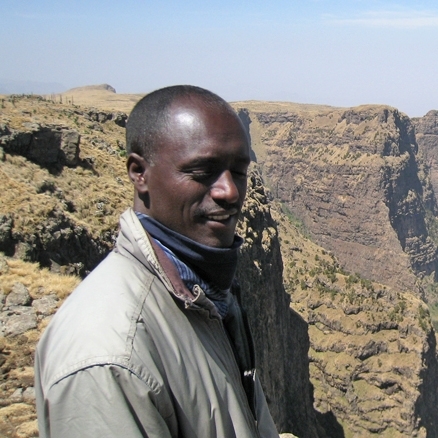 This is the ultimate trek in the Simien Mountains. With eight days of trekking it takes in all the National Park’s gems including the endemic wildlife havens of Sankaber, Geech and Chenek, and Ethiopia’s highest mountain Ras Dashen, 4,550m/14,928ft. Brimming with endemic fauna including the Geleda baboon, Walia ibex and Simien fox, an abundance of interesting flora and some of the world’s most majestic and colourful birds, the Simien Mountains should be on every trekker’s ‘wish list’. The trek also offers you the rewarding experience of summiting Ethiopia’s highest mountain, Ras Dashen from where there are breath-taking, panoramic views. And, to maximise your chances of successfully summiting this peak, we have included a rest day before your summit day. After sightseeing in Lalibela and Gondar you drive to the Simien Mountains National Park headquarters at Debark to sign in, before starting your trek on the escarpment near Michibiny and walking to your first camp. You then have five wonderful days trekking through stunning wild country, taking in a couple of lesser peaks and crossing the Bwahit Pass, to reach Ambiko from where you make your thrilling ascent of Rash Dashen. However, it’s not only the trekking that will leave an indelible impression. Ethiopia has a rich culture and ancient history and no visit to the country would be complete without taking time to explore its key cultural and historic attractions. Prime among these are the remarkable rock-hewn churches of Lalibela and the impressive 17th century castles at Gondar. You begin and end your trip in the thriving modern-day capital of Addis Ababa where you will discover its lively outdoor market, fascinating museums and good quality restaurants, offering a cultural and culinary feast in this well-balanced itinerary. Meal arrangements: Bed and breakfast in Addis Ababa, all meals elsewhere. Fly to Addis Ababa. Sightseeing. Fly to Lalibela, sightseeing. Fly to Gondar, sightseeing. Drive to Simien Mountains National Park. Trek to Sankaber and on to Geech. Trek to Immetgogo, Saha and Kedadit. Trek to Chenek. Trek to Ambiko via Bwahit Pass, 4,200m/13,780ft. Climb Ras Dashen, 4,550m/14,928ft, and descend to Ambiko. End trek at Chiroleba. Drive to Gondar. Fly to Addis Ababa, sightseeing. Fly to London. Day 2 - Arrive in Addis Ababa, 2,400m/7,874ft. Group transfer to hotel. Sightseeing. You arrive in Addis Ababa in the morning and will be met at the airport and transferred to your hotel. After a shower and rest, in the afternoon you will visit the National Museum famous for its palaeontology exhibits the most prominent, important, and memorable of which is 'Lucy', a fossilised bipedal 3.2 million year old hominid. She is famed for being the oldest and most complex hominid found. You will then move on to the Ethnological Museum, housed inside the Addis Ababa University, which provides a fascinating insight into the diverse cultures of the country. It has some imaginative displays including the music section. Your guide may suggest a drive through the Mercato, one of the largest open air markets in Africa. It is considered a haven for pick-pockets, so it is wise just to drive through. It's a lively and colourful spectacle where just about everything you can think of is on sale. Day 3 - Fly to Lalibela, 2,680m/8,793ft. Full day’s sightseeing. You will be taken to the airport for your Ethiopian Airlines flight to Lalibela. The journey from the airport to the Mountain View Hotel is around 20-30 minutes and you drive through the town before arriving at your hotel which sits in a prime spot on the hillside above the town. Recently built, this is a delightful hotel with plenty of character and charm and has been designed to maximise its superb location and views. Shortly after you have checked into your room, your tour guide for the day will meet you and take you to see what Lalibela is famous for, its rock-hewn churches. There are 11 churches in total and they date from King Lalibela's reign in the 12th and 13th Centuries. Not all the churches are carved into the rock-face, some are free-standing, but all are unique, captivating and are still very much used by priests, locals and pilgrims alike. Many Ethiopians make the pilgrimage here and it is a common sight to see them prostrating themselves both inside and outside the churches. Priests will proudly display their Ethiopian crosses which have many different designs. Devoid of UNESCO's scaffolding and possibly the most memorable of all the churches is Bet Giyorgis, a 15 metre, 3-tiered plinth in the shape of a Greek cross. After lunch back at your hotel, you will return to see the remainder of the churches including Bet Amanuel which is freestanding and replicates the style of Aksumite buildings. Day 4 - Fly to Gondar. Sightseeing. Your flight to Gondar is 30 minutes and you will be picked up on arrival and driven to the Goha Hotel which is Government run and is the best standard hotel in town. It is situated on top of a hill with a superb viewing point from which to admire the town below. The drive from the airport to the hotel is around 30-40 minutes and you will pass the yellow Italian buildings and the piazza of the town en route. It was here in 1636 that Emperor Fasiladas made Gondar his capital. Often described as Africa's Camelot, it is the town's castles and one of its remarkable churches that inspire. After lunch at the hotel, you will meet your guide and be taken to visit Debre Berhan Selassie Church which has some wonderful frescoes illustrating the story of Christ, and a unique ceiling covered with the faces of inscrutable cherubs. The church is surrounded by a wall with 12 towers representing the 12 apostles. Your next stop will be the Royal Enclosure, a 70,000 square metre site housing castles from Emperor Fasiladas' reign in the 17th Century. Lastly, you will visit Fasiladas' Bath which was used for Baptism ceremonies. Tree roots have consumed some of the stone wall surrounding the bath giving it an intriguing and engaging appearance. Day 5 - Drive to Simien Mountains National Park - 4 hours. Trek to Sankaber, 3,250m/10,663ft - 2 hours. An early start today - you drive into the Simien Mountains National Park to the start of your trek. En route to Debark you pass the villages of Ambagiyorgis, means 'hill of St. George and Davat'. The people from this area grow lentils, fenugreek, wheat, oat, barley, beans and tef (the staple Ethiopian cereal). The predominant tribe here are Amhara - both Christians and Muslims, although the former are the dominant population. The scenery is an impressive and vast expanse of distant mountains and escarpments. You pass many eucalyptus trees which are used for building houses and for firewood, and you will see many local traders in traditional, billowing robes going from place to place on foot or horseback - always with their trusty dula (wooden staff). The Simien Mountains National Park Headquarters is at Debark, 3,000m/9,850ft, and here you will need to register which takes about 5-10 minutes. From Gondar to Debark is around 2½ hours of driving and it is likely you will stop here for tea/coffee. Maps can be purchased here, although at 300 Bir (about £20) they are very expensive, so you would be better advised to purchase a map from home. You continue to drive into the National Park and shortly after the entrance to the Park you are likely to have your first, memorable encounter with a troop of gelada baboons. Due to the red patch on their chests (the subtle colours of which indicate their sexual condition at a given time), they are often called Bleeding Heart Baboons. These fascinating creatures, endemic to Ethiopia, are wonderful to observe. They are not too scared of humans, so you can get quite close and watch them dig frantically for roots, groom their mates, or just play. An hour and a half of driving from Debark brings you to an escarpment near Michibiny, 3,203m/10,508ft, where you will leave your 4 wheel-drive vehicle and walk for 2-3 hours to camp. Although you could drive straight to Sankaber, it is a very pleasant walk and will help you limber up for the coming days. It will also help with acclimatisation. The views are stunning and you may encounter the thick-billed raven, eagles and vultures. Flora you may see on today's walk includes lavender, thyme, St. John's Wort, wild iris, the endemic Abyssinian rose, fennel and solanon. The latter is from the tomato family, yellow in colour with a very prickly leaf. It is poisonous, but the locals use it for washing purposes. Sankaber campsite is situated at 3,250m/10,663ft and you are likely to be greeted on arrival by your crew with biscuits, nuts, popcorn, tea and coffee. The campsite has toilets, an alfresco shower (for those unconcerned about lack of privacy and cold water), tukuls (round huts with conical roofs) which the crew usually cook and sleep in.Today's short walk is a gentle undulating stroll and an ideal first day. Day 6 - Trek to Geech, 3,600m/11,811ft - 6 hours. Your walk this morning begins with a very pleasant and reasonably gentle stroll through heather and lichen forests. You may be lucky enough to spot the elegant klipspringer (antelope). After about 2½ hours you reach a viewing spot at 3,110m/10,203ft on a small hill top (Deche Nedala). This is where you will see the impressive Jinbar waterfall and vultures often circling in this deep gorge. You then climb fairly steeply for half an hour or so before the ground levels out, and eventually you reach the road. Here you may encounter some enterprising local children selling colourful little boxes made from a type of thick grass, painstakingly woven together. You leave the road from the left and proceed on a trail through several side valleys to reach Jinbar valley. It is here you are highly likely to spot a troop of gelada baboons. You head down to the Jinbar River at 3,195m/10,482ft, to bathe your dusty feet and have lunch. Today you are spoilt with a feast of flora including the endemic Abyssinian rose, the endemic globe thistle, jasmine flowers, lavender bushes, thyme and olive trees - these do not bear olives, but the locals use the branches as tooth-picks and the stems for charcoal, this latter use has caused the olive trees to become endangered. After lunch, you cross the river and ascend gradually on a good path for around 2 hours. On your afternoon's walk you will see hillsides terraced with barley. Unfortunately this cultivation along with overgrazing, has led to extensive soil erosion here. The highlanders barter their barley with the lowlander's tef. Tef is a staple Ethiopian cereal which is used to make Injera, the national dish. After about 1¾ hours from the lunch spot you approach the village of Geech, 3,465m/11,368ft, home to a Muslim population of around 300 households. They live in Tukuls (round huts with conical thatched roofs). The average family have around 6 children. Above Geech, you will see the endemic giant Lobelia. Measuring up to 10 metres in height, the plant grows for as long as 20 years before flowering, then dying. Another 135 metres of gradual ascent brings you to Geech camp, 3,600m/11,811ft - a large plateau with a few tukuls for your crew to cook and sleep in. On your walk today you stand a good chance of spotting vultures, lammergeyers, the endemic thick-billed ravens (usually very interested in your lunch), crows, kestrels and buzzards. Day 7 - Trek to Immetgogo, 3,926m/12,880ft, Saha, 3,785m/12,118ft, and Kedadit, 3,760m/12,336ft - 4 hours. A pleasant gentle uphill walk of around 2 hours, passing many of the endemic lobelia brings you to your first peak, Immetgogo at 3,926m/12,880ft. Along the trail you can see, on your right, the peak of Inatye 4,070m/13,277ft, where you will have your lunch tomorrow. You can also just see Chenek - your campsite for the following day. At the top of Immetgogo you have a breath-taking panoramic view of the surrounding mountains, including Ras Dashen, and the lowlands. You can see much of your entire trekking route including Arkwasiye and Sona. Birds you are likely to spot en route today include lammergeyers, buzzards, falcons, hill chats, and larks. Another hour of walking brings you to Saha 3,785m/12,418ft with a stunning view of the dramatic gorge below and two enormous rock towers. This is a good spot for lunch as you watch lammergeyers soar over the gorge. Your final viewpoint for the day is about another hour away at Kedadit, 3,760m/12,336ft. A half hour downhill stroll brings you back to Geech campsite. Today is a nice, easy day as the next few will be quite long and demanding. Day 8 - Trek to Chenek, 3,600m/11,812ft - 7-8 hours. Today you begin by ascending gradually for about 1½-2 hours. You then descend with an impressive view of the cliff face and gorge below Immetgogo. You may be fortunate enough to spot Walia Ibex here and, for the extremely fortunate, there may be a very rare sighting of the endangered and endemic Simien Fox, or Ethiopian Wolf as it is sometimes known. There are very few remaining in the park. Your lowest point before you begin ascending to the peak of Inatye is 3,600m/11,811ft. You ascend fairly steeply at first and then more gradually. You may well see shepherds herding their goats and gelada baboons. Your highest point today, where you will have lunch is Inatye at 4,070m/13,353ft. This takes about four hours from Geech campsite. You have an excellent panoramic view from this summit, of Immetgogo, Bwahit Peak, and the surrounding escarpments and mountains. You now begin your 2½-3 hour descent, steeply at first, taking care on the rocky trail, and then more gradually. You are likely to encounter 'mini' goat-herders here who are friendly children from the local village. About 10 minutes from camp there is an excellent viewpoint for potential Walia Ibex sightings. On the ornithological front, it is also a great day for spotting lammergeyers, buzzards, falcons, the endemic black-headed siskin, ground scraper thrush, and hill chat. The buzzards have an endearing habit of perching atop the giant Lobelia. The inside of the Lobelia is hollow and rumour has it that this is where poachers hide their weapons. There is a community lodge here which has a couple of beds and sells beer. Day 9 - Trek to Ambiko, 3,145m/10,318ft, via Bwahit Pass, 4,200m/13,780ft - 8-9 hours. Today is quite a tough and long day with 945m/3,100ft of total ascent and 1,400m/4,600ft total descent - a day to protect those knees by making full use of your trekking poles! Take plenty of water. Just above the campsite there is a good spot for viewing Walia Ibex. You continue ascending until another good viewpoint, approximately 280m/900ft from the campsite which provides superb views of Beroch Wuha, 4,272m/14,016ft and Silki, 4,420m/14,901ft, and the village of Lori below. You continue ascending until you reach Bwahit Pass at 4,200m/13,779ft. From here you can see Bwahit Peak, 4,430m/14,534ft, above you, and below you to the east you can see the village of Chiro Leba. You now embark on your long descent to the river - your lowest point on today's walk, at 2,800m/9,186ft. You will see plenty of activity with local people wandering up and down the trail, sometimes with donkeys bearing loads to trade, sometimes herding their goats, and you are likely to see ox and horses ploughing the land. After about three hours walking downhill from the pass you come to Chiro Leba - a sizeable village where you see village life in all its glory, and there may be a market taking place where vegetables, meat, herbs and spices are traded. Another hour or so of descent brings you to the river where you may like to follow the lead of your guide and give your feet a treat of a cold dip. From here it is about 1½ hours of ascent to reach Ambiko village and your night's stop. The village has an attractive circular church crowned with seven small spires which signify the seven sacraments. Day 10 - Rest/acclimatisation day in Ambiko. As yesterday was a long day, and climbing Ras Dashen will also be a tough day, we have decided to add a rest day here so that you are feeling fully fit and acclimatised for your ascent of Ras Dashen the following day. For those who would like to gain some height and help with acclimatisation, you could walk up to the col at 3,680m/12,073ft, and enjoy the scenery in the light. You will be taking this trail the following day, but you won't see much of it as it will be dark. Day 11 - Climb Ras Dashen, 4,550m/14,928ft, and descend to Ambiko - 10-12 hours. Your big day! You will have breakfast around 4.30am, ready for a 5am start. It can be quite cold and windy on the trail today, especially before the sun comes up so dress accordingly. Have your head-torch ready as you will be starting in the dark, although moonlight is remarkably effective for lighting up the trail. You begin walking reasonably steeply uphill on a good, rocky trail for about two hours where you will come to the col at around 3,680m/12,073ft. From the col you begin contouring around the hillside where you are likely to encounter the villagers tending their herd of goats or walking beside their donkeys loaded up with produce to trade. There is a plethora of giant lobelia on your walk today up to around 4,000m/13,000ft, and you are likely to spot buzzards and falcons soaring ahead. After contouring gradually for an hour or so you start ascending more steeply. Eventually you reach a wall which was built by the Italians for defensive purposes. There is a plateau here which is a good spot for a well-earned breather and a snack. From here it will take around 2 hours to the summit. The trail is reasonably obvious and easy until the last 50m/160ft or so where it becomes a straightforward and very enjoyable scramble. Congratulate yourself, fellow trekkers and guide as you top out at 4,550m/14,928ft, on a successful ascent of Ethiopia's highest mountain. Here you can see Analu which looks deceptively higher than Ras Dashen, but is, in fact 4,473m/14,675ft. For your descent, you retrace your steps all the way back to your campsite, making sure to take in all that you missed on your ascent due to exertion and darkness! The total ascent made today will be approximately 6-7 hours, with 4-5 hours descent (1,300m/4,265ft of ascent and descent). Day 12 - Trek to Chiroleba - 3 hours. Drive to Gondar. You retrace your steps back to Chirobela (approx. 3 hours walking). Here you will be met by the vehicle and drive back to Gondar. You will arrive in Gondar late in the afternoon. After dinner at the hotel, if you are looking for a lively bar down town to celebrate the successful completion of your trek, the Golden Gate is packed with young, trendy locals and is a great place to people watch with a couple of beers. The Ras Dashen Brewery is also a great place with good food and is an interesting way to buy beer. Day 13 - Fly to Addis Ababa, sightseeing. Check in at hotel. Late group transfer to airport. This morning you will be taken to Gondar airport for your 1½ hour flight (sometimes via Axum) back to Addis. On arrival you will be met by your guide and have a little time to complete any sightseeing you didn't manage to fit in on your first visit. Rooms will be reserved for you at the Wassamer Hotel so that you can rest and freshen up before having a very late transfer to the airport. Good group, well protected. A patient, friendly local leader, very reliable. We were very pleased to find that Mountain Kingdoms has a fine reputation there, everyone spoke highly of Mountain Kingdoms. The country has massive potential for tourism. Some very good close contact with Ethiopian people and culture, e.g. the Tej-house in Lalibela; coffee ceremony in village. My first time with Mountain Kingdoms and the holiday was BRILLIANT. The trek leader Kura and support staff couldn't have been more accommodating, knowledgeable or helpful. All the people we met were just delightful. The standard of vegetarian food on the trek was superb. It was the small surprises that really made the trip special - the camp crew greeting us with singing and dancing when we got back from Ras Dashen and the coffee ceremony that was prepared for us. This was extremely well planned and executed. The route, length of time and critical use of a rest day were all improvements on competitors' similar treks. The whole experience was enjoyable, a thoroughly planned route, a very compatible group of an ideal size, a flexible approach by the local tour leader and service provider. The trek leader and local guide were both exemplary in providing information and looking after the welfare of every member of the group. I have been on many, many treks but few as well organised as this one. The standard of care given by your local agents was excellent. Our guide was absolutely amazing. Not only was his knowledge of all things Ethiopian amazing, but his interaction with people we met added a great deal to our understanding of local issues and generally added to our enjoyment of this trip. He looked after our interests with a passion and was very intuitive to our needs. All the staff were first-class throughout.